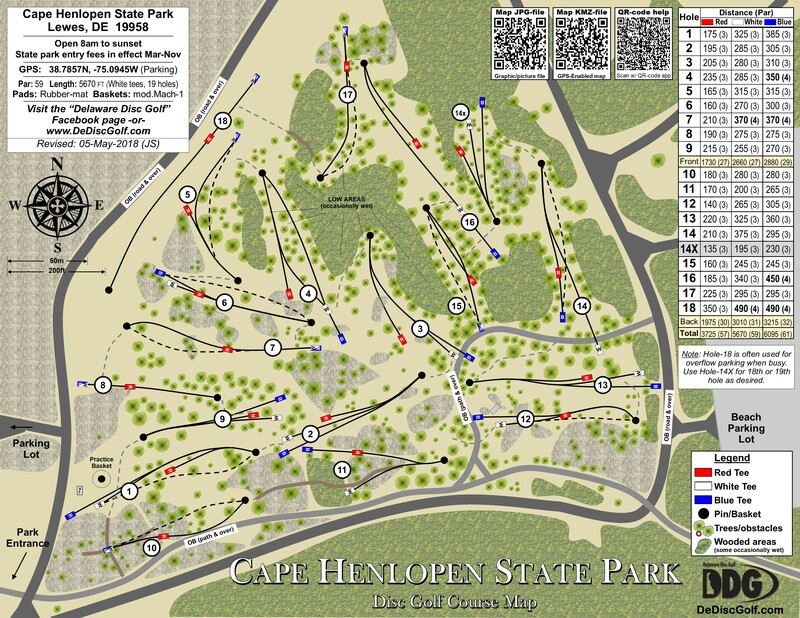 Originally designed in 1978 by the legendary Ed Headrick, this is one of the oldest disc golf courses in the USA. 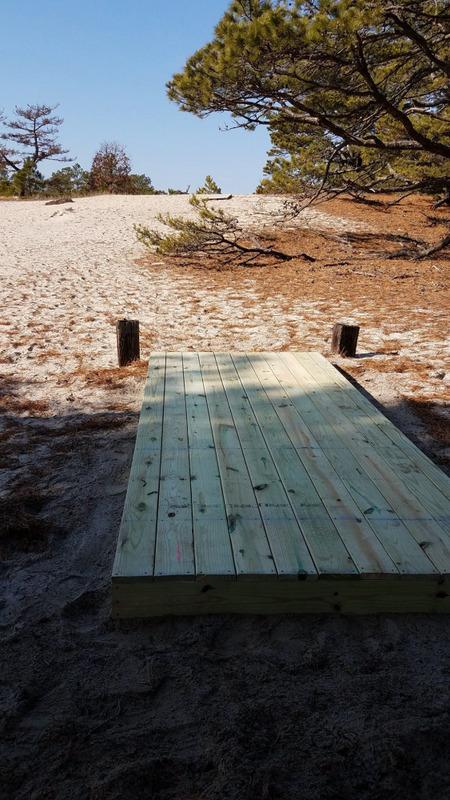 It is unique in that it plays on sand and in pines adjacent to the beach. 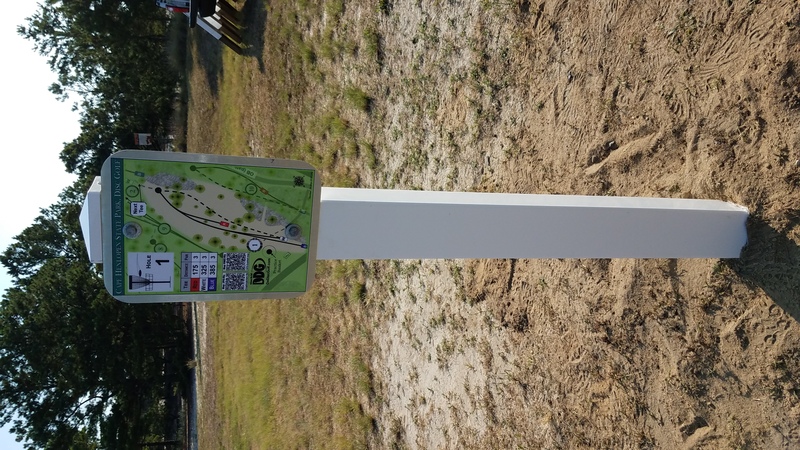 2018 renovations - new maps and signs installed at all the White tees. 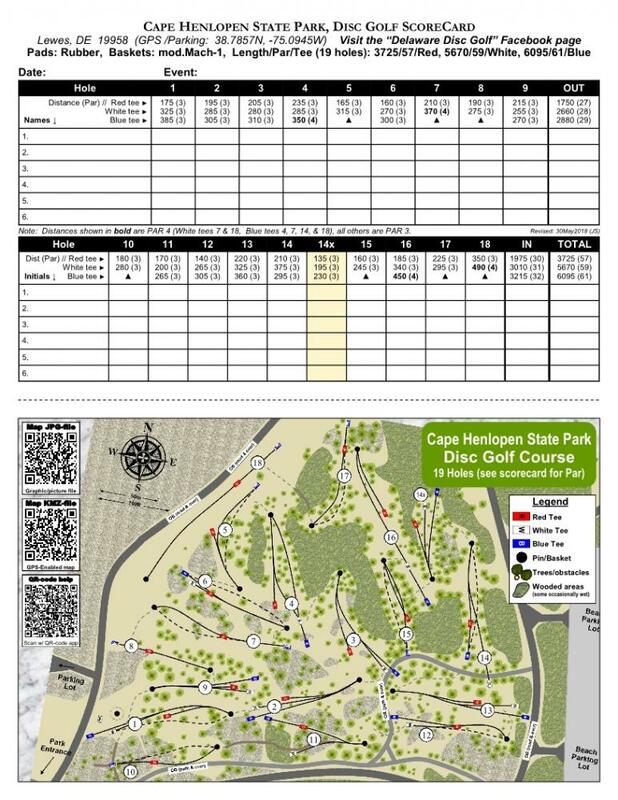 Scorecards/maps and discs at the nearby Seaside Nature Center. There are a total of 19 white tees, 12 longer blue tees and 19 shorter red tees which all play to the same baskets. 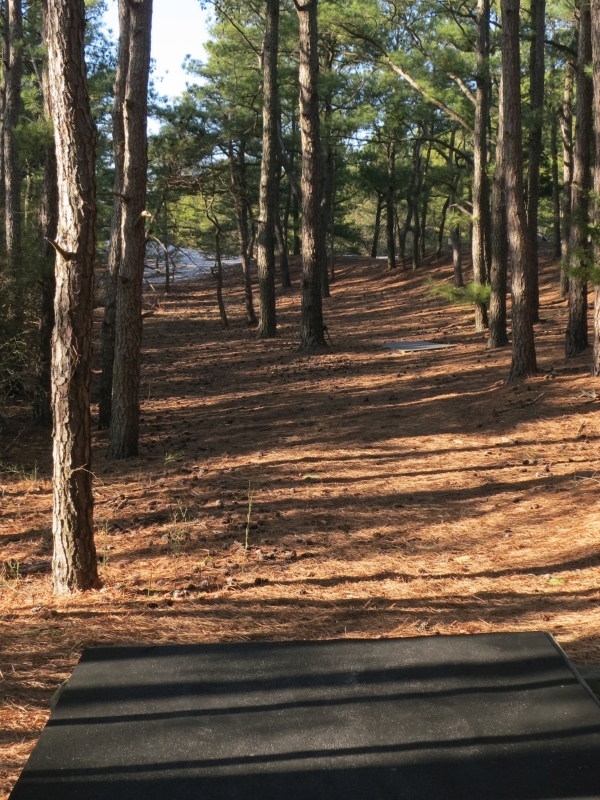 A fun yet challenging course - pine trees and breezy conditions. Use bug spray in the summer. From Dover, take Rte. 1 south about 45 miles, following Cape May Ferry signs. 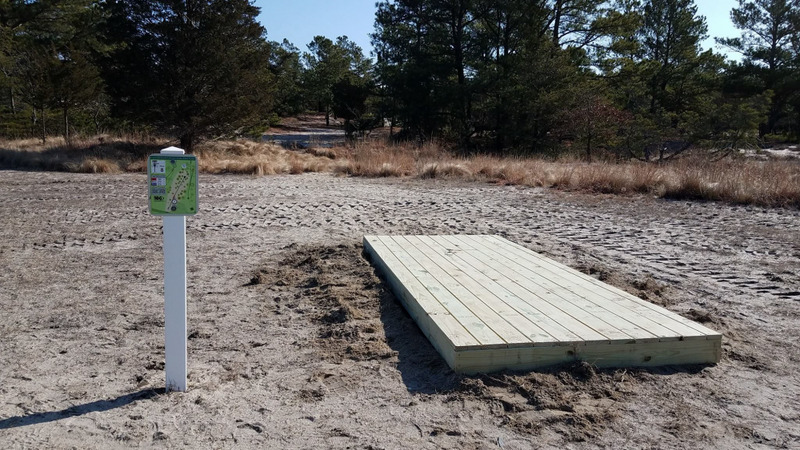 continue on Cape Henlopen Drive to the park entrance at the end of road. Go past fee collection booths and make a left toward the beach parking, next left past the Seaside Nature Center. 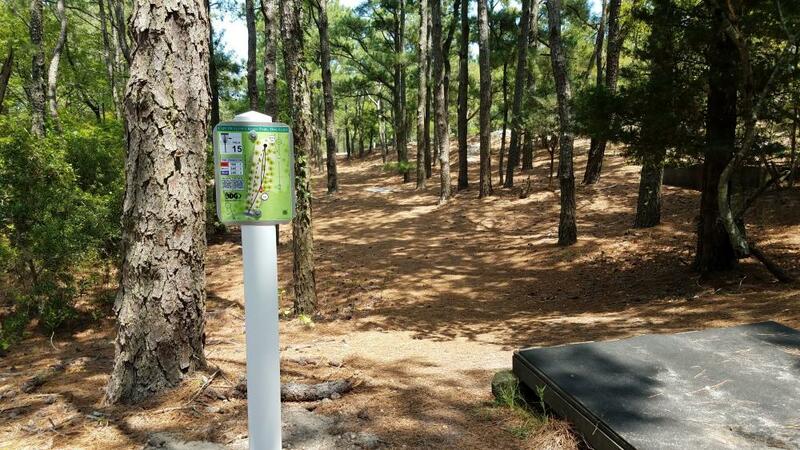 Disc golf kiosk is on the right. Make next left into parking lot by the basketball courts. I must say the very first time I played this course it became the absolutely worst in my book. 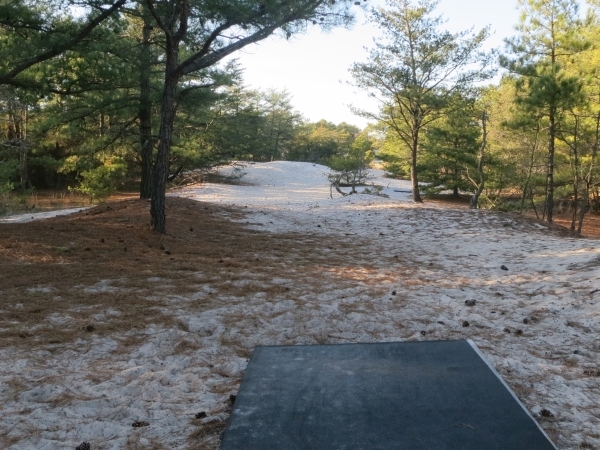 The rusty chains, the difficult to find next tee, and the interesting characteristics , were a major turn off. Then the next year in town , wifey says :" I'm going shopping with the girls, find something to do". Since we're staying in Bethany Beach, obviously Salisbury is too far to jet, and we hit that back to Baltimore anyway. So I bit the bullet and gave it another try. This time I had a better idea of the route, the dunes, the layout, and quite honestly the rusty chains (Mach-I) have grown on me (salt air eats everything). Now people ask me when I'm at the practice basket about the layout, I not only assist but talk the place up ! This now has become my favorite course. Actually I go barefoot as much a possible, yes you must watch-out for small ground cacti, but I like to extend summer as much as possible. The only improvement I would like to see is better signage for T-13, as it's down the path, and 15 is the first you get too. If your in town, give this a try. In fact, make it a day trip, as $10.00 get you all day, you have a beach, playground for the kiddies, bike rental (an amazing multi-mile long pier that takes you through beautiful wetlands), tons of walking trails, nature center, and if your the outdoors type; a full size. full hookup camping area. We only do off season to get away from traffic, heat, and most bugs have long gone, so I cannot speak of the in-season issues, possibly no worries, but maybe someone can offer that. Highly recommended, I give this many stars, not to be missed ! A truly unique course on sand dunes and scrub pines with lizards scurrying around. Usually cannot see target from start and usually no straight line approach to any hole. Getting Par is a challenge. But a great course not to be missed..
WHAT A FUN COURSE! It is very challenging and a great walk due to the sand dunes EVERYWHERE. And lots of trees and "shrubbery" to gobble up your efforts. This was a military base during WWII, and there are old concrete and steel poles that I wish "Steady Ed' would have integrated into the course layout. The $10 out-of-state admission price into this State Park was a bit high, but after playing DG, go to The Point for the great views, and take a tour of the fort to see what is was like during the war. OVERALL GREAT EXPERIENCE! Tough course. 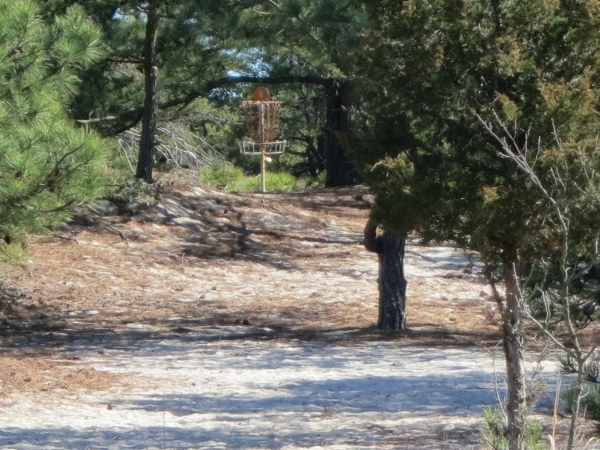 Sand dunes and pines make it very challenging to novices. I love it. Then again.... its only 2 miles away.